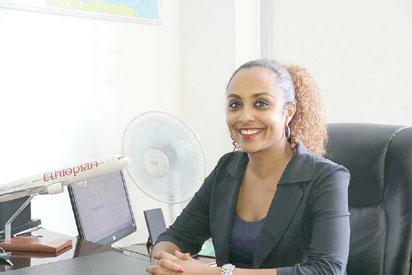 Pretty and delectable Firiehiwot Mekonnen is the General Manager of Ethiopia Airlines in Nigeria.Before rising to her new position, the mother of one was head of traffic and sales in Abuja. In the wake of the news of Ethiopia Airline powering with an all female crew of pilots, engineers and cabin crew members in an international flight from Boles International Airport Addis Ababa to Lagos, she speaks of the massive responsibility of managing ET’s huge business of five daily flights to and from Nigeria and her love for and relationship with the country. She also speaks about the new ET policy of empowering women to be the very best of what they could be and other issues. What was your first impression about Nigeria upon your arrival? My first impression about Nigeria was very nice and very beautiful. Nigerians are very enterprising people. They are very happy and bubbly with energy. I like that. They can start up a conversation with you even when they do not know you. Did you hear any stories about the country before your arrival? Yes I heard a lot about Nigeria before my posting that Nigeria is Africa’s giant with lots of blessed resources. I also heard some crazy stories about how Nigerians act. I have since found out that most of the stories are exaggerated. Yes to some outsiders, Nigerians are different but Nigerians are one of the most welcoming people I have met. Did your real impression fit into the stories you heard? In fact the impression I got once I came to Nigeria was different from what I heard. I came to really connect with Nigeria and Nigerians. I eat Nigerian food, dress in Nigerian attire, participate in different social gatherings. All these and others doubled my love for the country and its people who are really friendly. I cannot describe how it feels to attend Nigerian parties and events. It is so colorful. Are there Nigerian foods, culture and traditions including fashion that you connect with? I love Nigerian food. In fact, I go out with friends to Nigerian restaurants. I love the culture of friendship and family ties too. The attires are really different and I have quite a number of Nigerian national dresses because they are beautiful, colorful and graceful. I feel happy whenever I wear them. Even my family members and friends now have Nigerian dresses. I have been exposed to the richness of Nigerian culture and its people, Nigerian films (Nollywood) and the music. Do you know that Dangote has become a household name in Ethiopia since he built one of his factories in Ethiopia? There are very few women managing many big organizations including airlines like you; do you see this development as a change from the norm and a win for women in the world and especially in Africa? I see the world as continuously changing as to give more opportunity to women to become more leaders at the top of organizations and this is already proving itself by the way of increased productivity and improved efficiency Ethiopian Airline, the leading aviation group in Africa is taking the leading path in making this come true. One of the value statement of Ethiopian Airline is “ equal opportunity, employer committed to diversity and fairness” So you can see that this is happening already. ET has given women the chance to be pilots, engineers, ground handlers, aviation instructors, regional and country managers. If you come and see the biggest aviation Academy in Africa is in Addis Ababa, Ethiopia you will see lots of women studying these fields from all over Africa countries. ET did an amazing thing recently when it launched an all women crew; do you see this as also one of the winning ways for African women? ET brought the all women operated flight to Lagos on December 16, 2017 to show that women can do anything and to show that Nigeria can be a leading country that empowers women. This all women operated international flight was the first in Africa and it got applause from all corners of the world. Again on March 8, 2018, ET will do another all women operated flight to one of our new international destinations Buenos Aires, Argentina. This is intended to inspire African girls. This very bold statement is very important. Could you make an assessment of ET business in Nigeria and Africa in general? Already we are seeking partnerships with other African countries to strengthen their capacity to thrive like us. We are doing this in Togo, Malawi, Zambia, and more recently in Guinea. We fly to over 100 destinations worldwide with the most modern fleet of Boeing B787, Dreamliner B777 and Airbus A350. With our vision 2025 strategy, we are opening up more international routes in the next six months including to Geneva Switzerland, Buenos Aires Argentina, Nosybe Madagascar, and Kisangani DRC. The post My family members, friends in Ethiopia now wear Nigerian dresses because of me —Ethiopian Airlines boss confesses appeared first on Vanguard News. THE YOUNGEST LG SOLE ADMINISTRATOR IN LAGOS, HON GBENGA ABIOLA, UI’S SOCIAL APP MAKING GROUP, UI E MESSENGERS, A STUDENT OF FUTO EKOMOBONG FINBARR AND 31 OTHERS TO PICK UP HONORS AT THE 8TH EDITION OF THE ALL YOUTHS TUSH AWARDS.